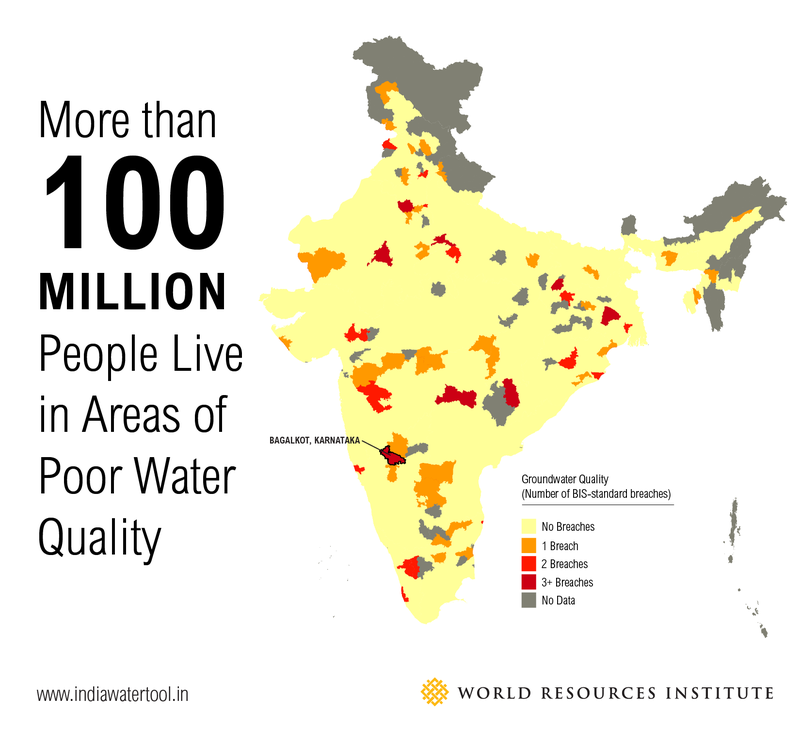 In India more than 100 million people live in areas of poor water quality. Photo by Sambhaav Trust/Flickr. Groundwater levels are falling as India’s farmers, city residents and industries drain wells and aquifers. What water is available is often severely polluted. And the future may only be worse, with the national supply predicted to fall 50 percent below demand by 2030. Enter the India Water Tool 2. 0. The new web platform is the most comprehensive, publicly available online tool evaluating India’s water risks. Created by a group of companies, research organizations, and industry associations—including WRI and coordinated by the World Business Council for Sustainable Development (WBCSD)—the tool can help companies, government agencies, and other water users identify their most pressing challenges and carefully target water-risk management efforts. The map below illustrates competition between companies, farms and people for surface water in rivers, lakes, streams, and shallow groundwater. Red and dark-red areas are highly or extremely highly stressed, meaning that more than 40 percent of the annually available surface water is used every year. 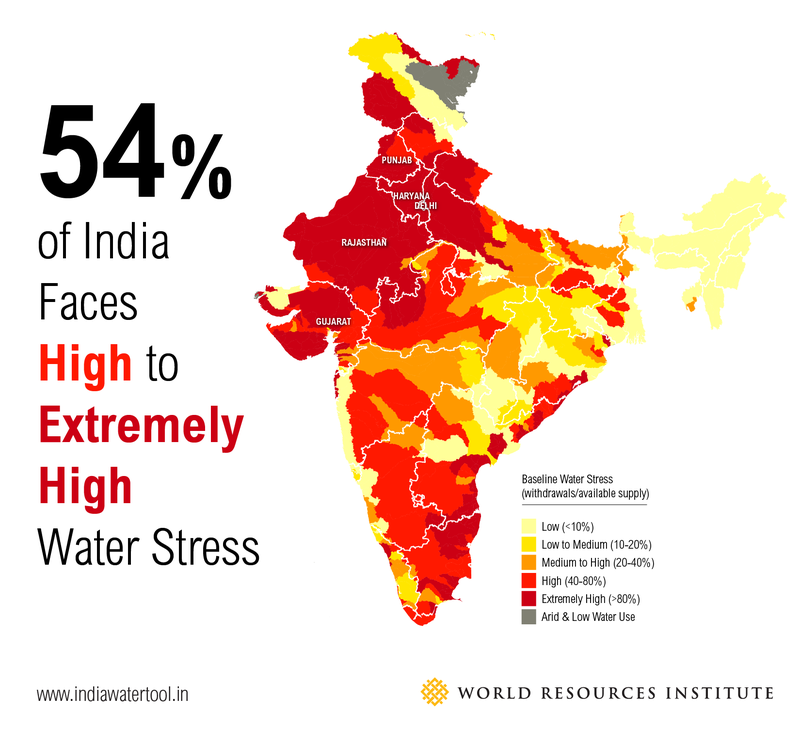 With 54 percent of India’s total area facing high to extremely high stress, almost 600 million people are at higher risk of surface-water supply disruptions. Note, in particular, the extremely high stress area blanketing Northwest India. The region is India’s breadbasket. The states of Punjab and Haryana alone produce 50 percent of the national government’s rice supply and 85 percent of its wheat stocks. Both crops are highly water intensive. 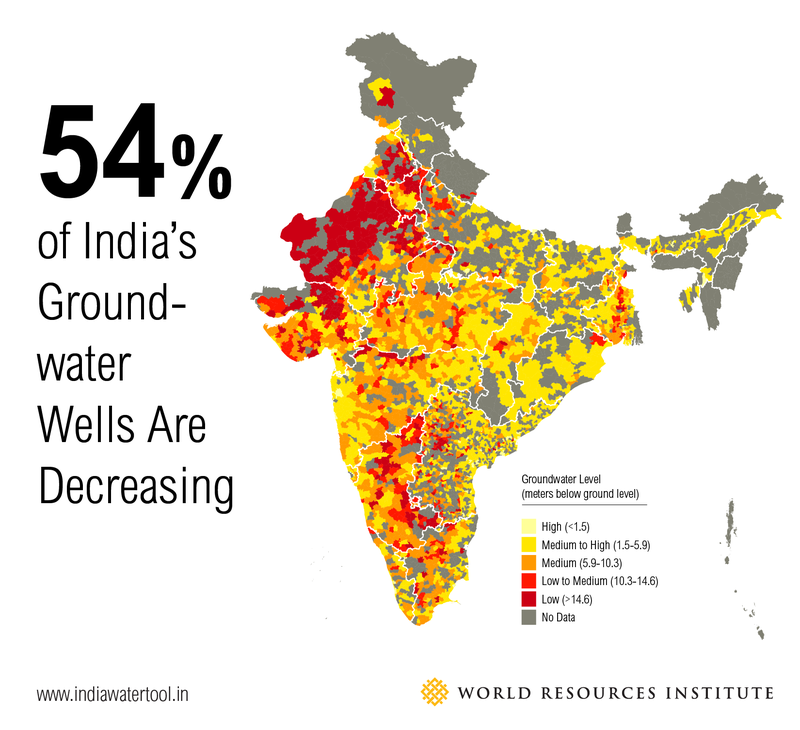 Groundwater levels are declining across India. Of the 4,000 wells captured in the IWT 2.0 showing statistically significant trends, 54 percent dropped over the past seven years, with 16 percent declining by more than 1 meter (3.2 feet) per year. Farmers in arid areas, or areas with irregular rainfall, depend heavily on groundwater for irrigation. The Indian government subsidizes the farmers’ electric pumps and places no limits on the volumes of groundwater they extract, creating a widespread pattern of excessive water use and strained electrical grids. Northwestern India again stands out as highly vulnerable. Of the 550 wells studied in the region, 58 percent have declining groundwater levels. The IWT 2.0 measures water quality with an Indian-government standard called Bureau of Indian Standards (BIS) limits. Surface and groundwater are both below par in many areas. Among the IWT’s 632 groundwater quality districts, only 59 are above BIS limits. Whenever a particular pollutant concentration exceeds BIS limits, drinking water is considered unsafe. The yellow and red areas below indicate places where chlorine, fluoride, iron, arsenic, nitrate, and/or electrical conductivity exceed national standards. These districts are also extremely populous. 130,600,000 people live in districts where at least one pollutant exceeded national safety standards in 2011. And more than 20 million people lived in the eight districts where at least three pollutants exceeded safe limits. Bagalkot, Karnataka, is the most polluted, with five of six groundwater quality indicators at unsafe levels. Only arsenic falls below the government-recommended concentration level. The India Water Tool was specifically designed to help companies, government agencies, civil society organizations, and other stakeholders assess water risks, a critical first step toward reversing the damage already done to India’s water supplies and protecting against chronic struggles. Users can upload or enter hundreds of GPS-based locations into the easy-to-use interface. For each location, the tool will produce values quantifying water stress, groundwater depletion, current and projected groundwater availability, water quality, rainfall and more. The tool can also create a map showing all the uploaded locations, which can either be kept private if the information is sensitive or exported as a communications product or as a visual for a corporate disclosure initiative. For example, India’s state and national governments could use the tool to understand threats to surface and groundwater water security, and therefore support long-term development planning and conservation planning. Tools like the India Water Tool may only be a first step in a long process of risk reduction and mitigation, but they are an essential one. Only with ongoing efforts to improve data transparency and accessibility can India advance toward a sustainable water future.